JSON Web Encryption is vulnerable to a classic Invalid Curve Attack. 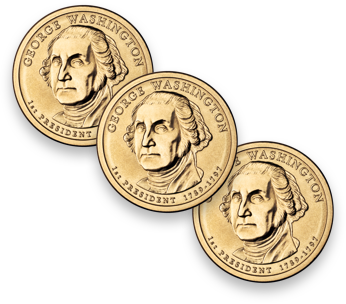 Learn how this may affect you and what to do about it. TL;DR If you are using go-jose, node-jose, jose2go, Nimbus JOSE+JWT or jose4 with ECDH-ES please update to the latest version. RFC 7516 aka JSON Web Encryption (JWE) and software libraries implementing this specification used to suffer from a classic Invalid Curve Attack. This can allow an attacker to recover the secret key of a party using JWE with Key Agreement with Elliptic Curve Diffie-Hellman Ephemeral Static (ECDH-ES), where the sender could extract receiver’s private key. 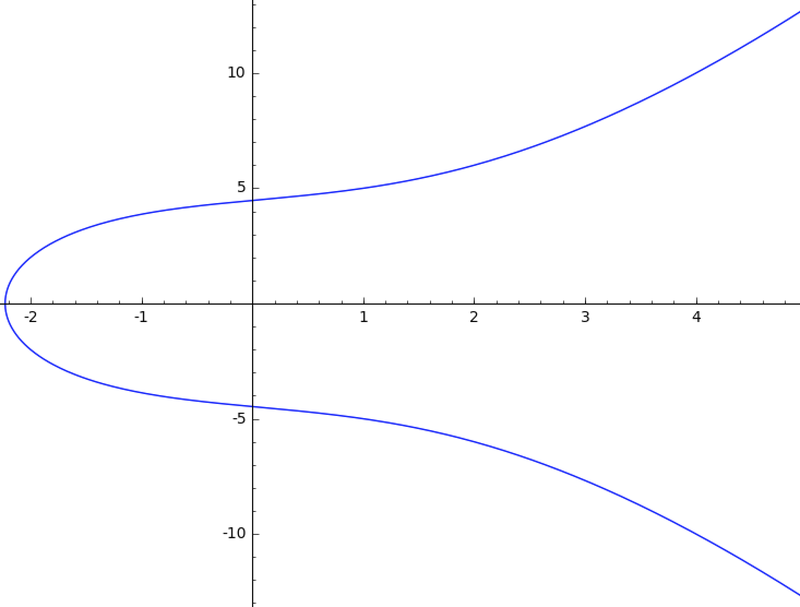 In this blog post I assume you are already knowledgeable about elliptic curves and their use in cryptography. If not Nick Sullivan's A (Relatively Easy To Understand) Primer on Elliptic Curve Cryptography or Andrea Corbellini's series Elliptic Curve Cryptography: finite fields and discrete logarithms are great starting points. Then if you further want to climb the elliptic learning curve including the related attacks you might also want to visit https://safecurves.cr.yp.to/. Also the DJB and Tanja talk at 31c3 comes with an explanation of this very attack (see minute 43) or Juraj Somorovsky et al's research can become handy for learners. Note that this research was started and inspired by Quan Nguyen from Google and then refined by Antonio Sanso from Adobe. This is only one of the many possibilities JWE provides. A separate specification called RFC 7518 aka JSON Web Algorithms (JWA) lists all the possible available algorithms that can be used. The one we are discussing today is the Key Agreement with Elliptic Curve Diffie-Hellman Ephemeral Static (ECDH-ES). This algorithm allows deriving an ephemeral shared secret (this blog post from Neil Madden shows a concrete example on how to do ephemeral key agreement). As a symmetric key used to wrap the CEK with the A128KW, A192KW, or A256KW algorithms, in the Key Agreement with Key Wrapping mode. This is out of scope for this post but as for the other algorithms the JOSE Cookbook contains example of usage for ECDH-ES in combination with AES-GCM or AES-CBC plus HMAC. As we will see thorough this post this simple observation will be enough to recover the receiver’s private key. But first we need to dig a bit into elliptic curve bits and pieces. For JWE the elliptic curves in scope are the one defined in Suite B and (only recently) DJB's curve. 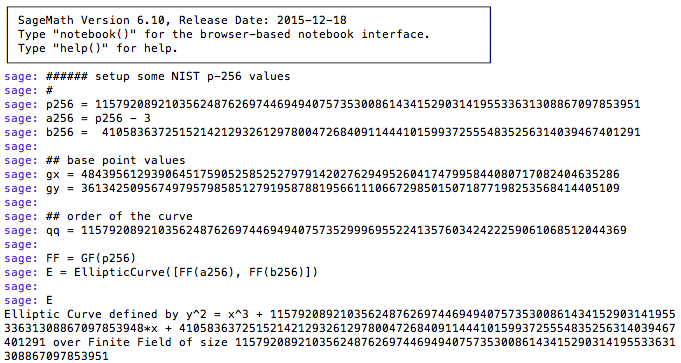 Between those, the curve that so far has reached the higher amount of usage is the famous P-256. y2 = ax3 + ax + b. As you can see from the image above we just found a nicer curve (from the attacker point of view) that has an order with many small factors. 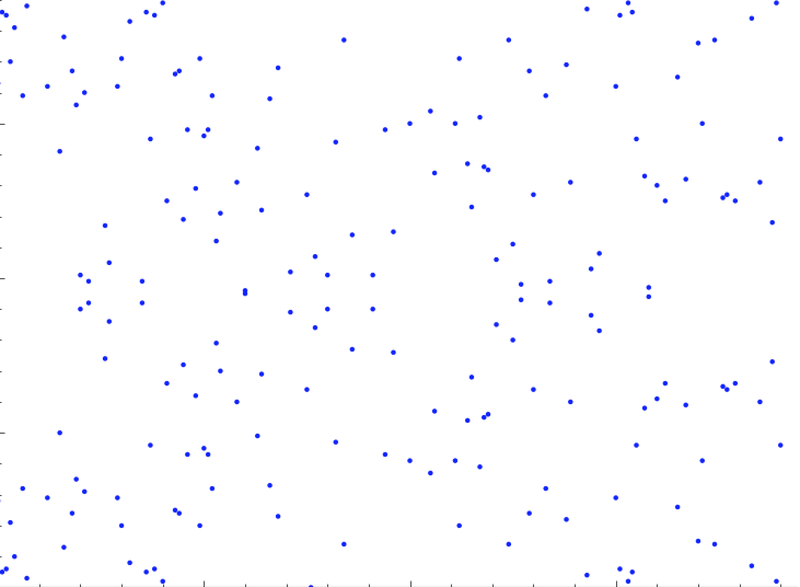 Then we found a point P on the curve that has a really small order (2447 in this example). Now we can build malicious JWEs (see the Demo Time section below) and extract the value of the secret key modulo 2447 with complexity in constant time. A crucial part for the attack to succeed is to have the victim to repeat his own contribution to the resulting shared key. In other words this means that the victim should have his private key to be the same for each key agreement. Conveniently enough this is how the Key Agreement with Elliptic Curve Diffie-Hellman Ephemeral Static (ECDH-ES) works. Indeed ES stands for Ephemeral-Static were Static is the contribution of the victim! At this stage we can repeat these operations (find a new curve, craft malicious JWEs, recover the secret key modulo the small order) many many times and collecting information about the secret key modulo many many small orders. And finally Chinese Remainder Theorem for the win! At the end of the day the issue here is that the specification and consequently all the libraries I checked missed validating that the received public key (contained in the JWE Protected Header is on the curve), You can see the Vulnerable Libraries section below to check how the various libraries fixed the issue. Again you can find details of the attack in the original paper. An application that wants to POST data to this server needs first to do a key agreement using the server's public key above and then encrypt the payload using the derived shared key using the JWE format. 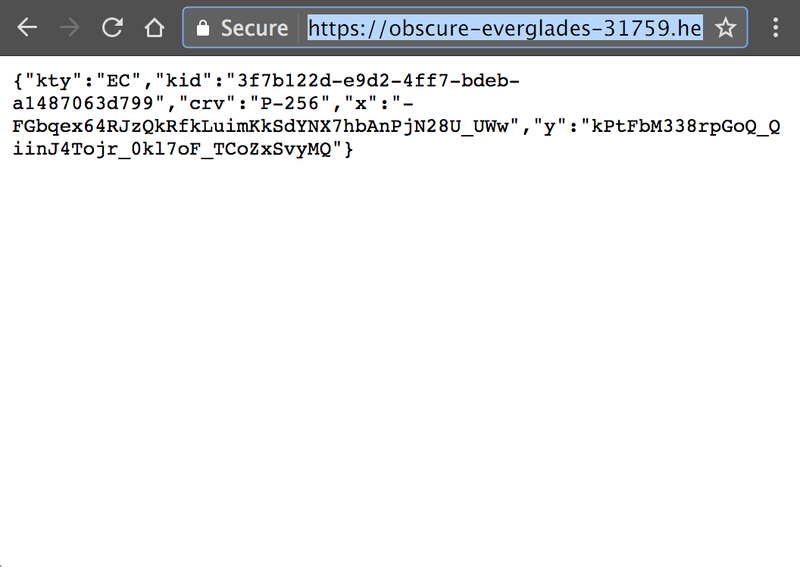 Once the JWE is in place this can be posted to https://obscure-everglades-31759.herokuapp.com/secret. The web app will respond with a response status 200 if all went well (namely if it can decrypt the payload content) and with a response status 400 if for some reason the received token is missing or invalid. This will act as an oracle for any potential attacker in the way shown in the previous The Attack section. 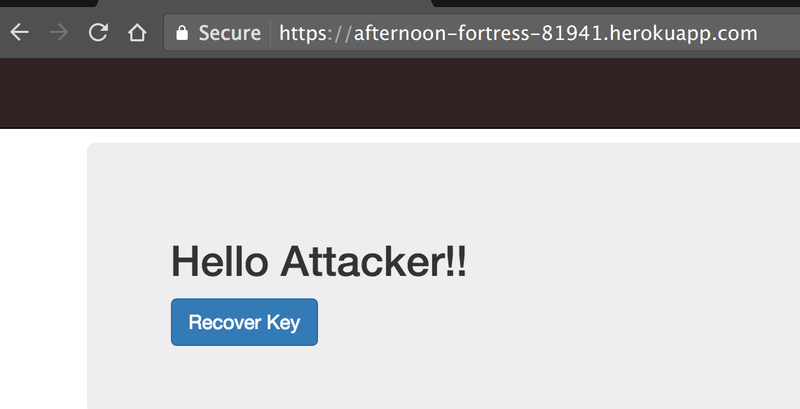 I set up an attacker application in https://afternoon-fortress-81941.herokuapp.com/. You can visit it and click the 'Recover Key' button and observe how the attacker is able to recover the secret key from the server piece by piece. Note that this is only a demo application so the recovered secret key is really small in order to reduce the waiting time. In practice the secret key will be significantly larger (hence it will take a bit more to recover the key). https://github.com/asanso/jwe-receiver contains the code of the vulnerable server. https://github.com/asanso/jwe-sender contains the code of the attacker. jose2go's fix landed in version 1.3. * Latest version of Node.js appears to be immune to this attack. It was still possible to be vulnerable when using browsers without web crypto support. ** Affected was the default Java SUN JCA provider that comes with Java prior to version 1.8.0_51. Later Java versions and the BouncyCastle JCA provider do not seem to be affected. I reported this issue to the JOSE working group via mail to the appropriate mailing list. We all seem to agree that an errata where the problem is listed is at least welcomed. This post is a direct attempt to raise awareness about this specific problem. We offer a generous free tier to get started with modern authentication. The author would like to thanks the maintainers of go-jose, node-jose,jose2go, Nimbus JOSE+JWT and jose4 for the responsiveness on fixing the issue. Francesco Mari for helping out with the development of the demo application. Tommaso Teofili and Simone Tripodi for troubleshooting. Finally as mentioned above I would like to thank Quan Nguyen from Google, indeed this research could not be possible without his initial incipit. Antonio works as Senior Software Engineer at Adobe Research Switzerland where he is part of the Adobe Experience Manager security team. Antonio is co-author of "OAuth 2 in Action" book. He found vulnerabilities in popular software such as OpenSSL, Google Chrome, Apple Safari and is included in the Google, Facebook, Microsoft, Paypal and Github security hall of fame. He is an avid open source contributor, being the Vice President (chair) for Apache Oltu and PMC member for Apache Sling. His working interests span from web application security to cryptography. Antonio is also the author of more than a dozen computer security patents and applied cryptography academic papers. He holds an MSc in Computer Science.